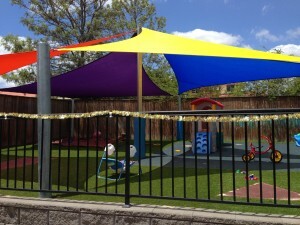 Brilliant shade Sails Pty Ltd is a specialist in designing shade sail project for Childcare Centres. Our staff members who will be dealing and working in the various Childcare Centres have clearance from the Commissioner for “working with Children”. We make sure that the guidelines set by the CANCER COUNCIL OF AUSTRALIA regarding the minimum UV rating for a shade sail is strictly followed. When shade sails are under tension, the amount of direct sun light creeps through the holes determine the amount of UV Radiation gets through. It is our duty of care to advise the customer about the UV ratings and we are proud supporters of the set guidelines.